As usual ONE or THREE vehicle regular tanks (depth about 500 ... 700mm). 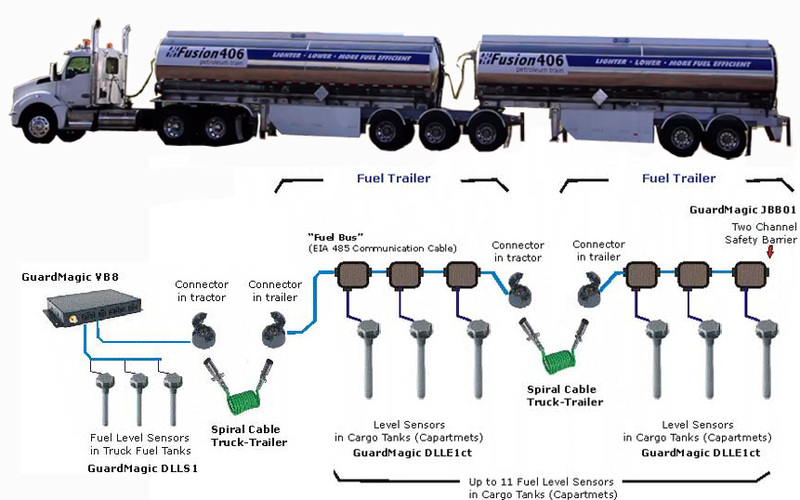 Main structure of fuel monitoring of road fuel tanker: Tractor + "Fuel Tank Semitrailer+ Fuel Drawbar Trailer"
Only if need monitor tractor regular fuel tank. This cable is intended for easy connection fuel level sensor GuardMagic DLLS1 to main module. Cable length can be from: 2 meters and up to 10 meters. Cable made of oil, fuel, water, UF resistance cable. If necessary for additional mechanical protection this cable be mounted inside additional flexible plastic tube. As usual length of this cable is 5 meters or 7 meters. For electrical connection "Safety Barrier" and trailer connector. If necessary for additional mechanical protection cable be mounted inside additional flexible plastic tube. In additional in trailer can be installed Trailer identification module.